A flat, wormlike body. 1″ or more in length with one pair of long legs for almost each body segment. The house centipede is grayish-yellow with three dark stripes running the length of the body. It has 15 pairs of legs with hind legs more than twice its body length. Found throughout the country. 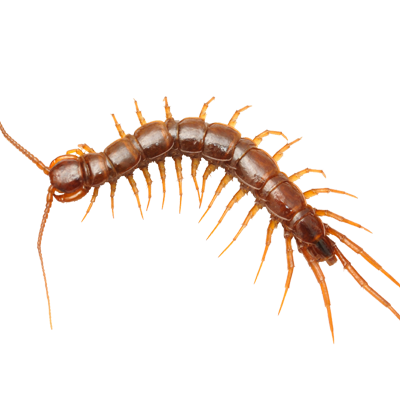 House centipedes live in damp areas such as cellars, closets, bathrooms. Outdoors they can be found in damp locations under leaves and stones.